Do you know what would make Christmas even more perfect here on Okay! Musume Time's Winter Wonderland Idol Bonanza? Snow. Snow is what would make this place perfect for the season of festivity! Sadly we don't have snow littering about anywhere, so instead we will have to make do with some joyous songs and a few Carols to keep our spirits up! When snow is out of the question, turn to music! And when it comes to Christmas music, I have the perfect soundtrack in mind to fill my 12 Days of Idols with sweet tunes and festive cheer! Are you ready to sing along with me? The Douyou Pops Christmas CD! Back in 2010, way back when I was first getting into Idols and Hello! Project properly, I was introduced to or found out about a collection of Christmas songs by various members of the Hello! Project collective during the winter season. At that time I was probably surprised that there were Japanese Christmas songs because it was still a little new to me, but after listening to them I became addicted - that said, I have always become easily addicted to Christmas songs, so this was nothing new - and I found myself obsessed with these songs to the point where I started to annoy my family with the incessant playing of Christmas songs they couldn't really understand. But I loved it, so for me that was all that mattered. Now I will be honest, I haven't actually listened to The Douyou Pops 1 Christmas to Fuyu no Uta Shuu for a while, in fact I forgot it existed until recently when looking back at Christmas songs I enjoyed in the past from the Idols I love, so when I rediscovered it I was happy to realise that I still really do enjoy this album... well, the songs that I enjoyed from it the first time around, at least because I know that when I first found out about this album, I ignored songs with names I didn't recognise, so when I finally listened to the album in full I was able to see if I liked what I had missed out on or not, and honestly it's a mixed bag I suppose in terms of how I feel towards a few of the unknown songs. This album is wonderful, though; its easy to listen to, filled with spirit and fun and whilst the vocals aren't always the best in it (Konno is especially weak, here) I did enjoy what everyone brought talent-wise. Of course this is an album meant for children, filled with pop and folk songs that are easily recognisable and fun to sing along to. 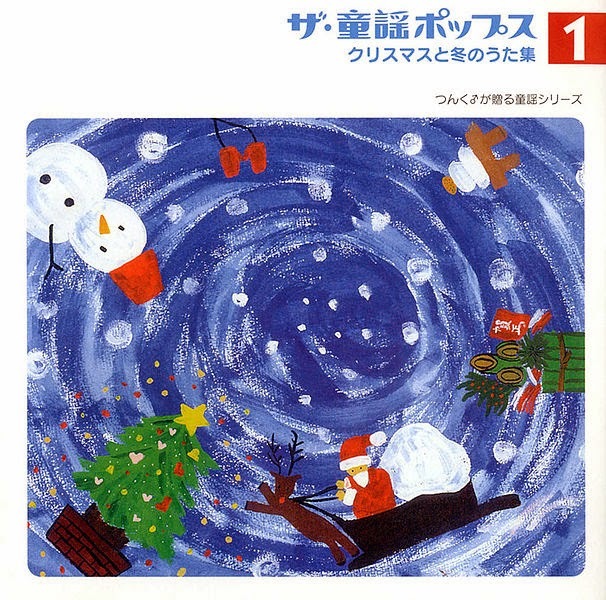 The soundtracks are merry and bright and will appeal to most children I believe, especially songs like Kaze mo Yuki mo Tomodachi da (a personal favourite of mine), Santa ga Machi ni Yattekuru and Jingle Bell, which is a spectacular opening song for such a fun-filled album if you ask me. It's energetic and gives a nice kick to the opening of this Christmas-filled album, so I really appreciate that it was the song that opened the whole album; it set off a good mood, and basically prepared me for more fun and games with these songs. The only thing I found that I didn't like much regarding the album's songs was that they are all far too short; the songs run for about 2~3 minutes each, sometimes less and sometimes a little bit more, but that's also the reason as to why the album is so easy to listen to; it doesn't go on for too long or drag itself out, so you have something fun but not necessarily too long, meaning it's easier to remember and gives the kids time to enjoy it without getting bored. As an adult however, someone who enjoys songs that go on, I find the length of the Douyou Pops 1 songs a tad disappointing; I want to enjoy my Christmas tunes, not hum them once and then realise that they've ended! Aside from the length though there was also the addition of Tako no Uta which seemed to have stumped me a bit when listening to the album; isn't this a country song, and a not-very-Christmas sounding one at that? It really sounds nothing like Christmas at all! That said, I could be wrong; the lyrics could be about Christmas or Winter for all I know, but in sound... well, this song sticks out like a sore thumb. Every other song sounds like it fits the bill perfectly, working with the other songs in perfect harmony, up until Tako no Uta starts and we're suddenly somewhere different... it's a nice song, don't get me wrong, but it feels more like a Summer/Autumn song than a Christmas one, so the sound of it really doesn't work with the rest of the album in my mind. Still, regardless of that one song and the short length of the songs, I really do enjoy this album when I listen to it. It's fun, it holds catchy, memorable tunes from our childhood and is something that you can happily give to your kids to listen to and allow them to immerse themselves in wonderful Winter-themed songs without them getting too bored by them. I'm really happy that I rediscovered this album at this time of the year, because honestly I do love these songs; they remind me of my childhood and singing along to Rudolph the Red-Nosed Reindeer or Jingle Bells and enjoying myself immensely. It's a wonderful little album, one that is filled with joy and happiness and Christmas songs old and unknown. Hopefully this season, you will find joy in this album too! So what did you think of The Douyou Pops 1 Christmas to Fuyu no Uta Shuu? Do you have a favourite song that you will happily sing along to? Let me know!